I’ll have a really awesome post soon from someone who submitted a proposal to work on the A.I for Trespasser. He left a comment on the blog a while back, but i held back publishing in in the hope he could elaborate a bit more so i could post it for everyone to read. Here’s some more instant jungle and a bit more water. ~ by newoldmate on 22/05/2015. 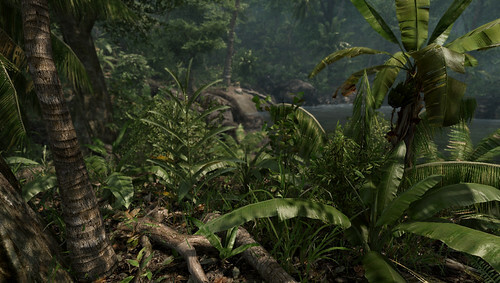 Listen to wise advice… Drop CryEngine as fast as possible. I can’t think of one indie game that runs on that engine. It’s very unfriendly for developers, with no support base. Consider U4 or Unity. Few months ago you had a quick glance at Unity – don’t know why you didn’t go that way. Unity Asset store has hundreds of fully animated dinos, weapons, vehicles and environmental stuff.